When it comes to selling on Amazon, seller feedback is very important. In this episode we talk about how to deal with a bad seller rating, and we also go over how to create a new brand within the same Amazon seller account. Q1: I had a customer that left me bad seller feedback. I didn’t have many seller feedback so now my feedback is 3 starts over all. He said that the product was broken. I sent him a message a few times to tell him that I could send him a new one but he won’t respond. What would you do? MANNY: Did you catch the clue there Gui? GUI: He had very little feedback? MANNY: With seller feedback – he was talking about seller feedback and not a product review. The product was broken so it’s not seller feedback. What I would do is would not even contact the customer but you can get it removed automatically. You go into seller central, copy the order ID, go to the contact form where you would contact seller support. There will be something like customer orders I believe and then paste the order ID in there, tell them it’s about seller feedback and then they automatically remove – their algorithm will figure it out. If it doesn’t automatically remove it, it gives you the option to submit a little summary and say it’s about a product review and not seller feedback. Your seller feedback will be restored. GUI: You also never want to be in that situation where one negative feedback affects you so much. 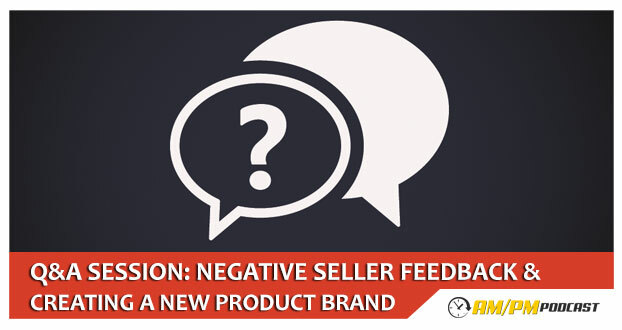 You have to be proactive about negative seller feedback and follow up with email after they’ve placed their order to ensure positive feedback. MANNY: Let’s get to question number 2. Q2: I have a second product totally unrelated to my first product and I want it to be under a new brand. I hear Amazon won’t let me open a second account. How can I do this? MANNY: If you want to create another brand, you don’t need a second account. You can open more than one brand under a single account. When you create your new product on Amazon and you have that field where it asks for your brand, that’s where you’re going to place it. When someone does a search and your listing comes up and it says “sold by” whatever your company name is, it shows the brand name and when someone clicks on that it will only show the products of that one brand. I’ve got four brands under one account. GUI: If you have the idea to build up your brand and sell it, would it be good to create another account if Amazon allows you to? MANNY: Yeah, that would be a good strategy but most of the time you don’t know if the products are going to take off. If you set up a different account and the product doesn’t take off, you spent all this money to set it up for nothing.